Shoigu’s measures were announced (right) between 11 and 12 noon on Monday, and broadcast on the state media within minutes. In effect, Shoigu declared a 400-kilometre no-fly zone for all foreign aircraft over Syria or the sea and land approaches to Syria from Israel, Jordan, Lebanon, Turkey and Iraq. Also excluded are aircraft from the US base at Al-Tanf, inside Syria, and the British airbase at Akrotiri, Cyprus. Shoigu’s double reference — to the range of the S-300 and to centralized command-and-control – means that the S-400 radars already installed for the defence of the Russian air base at Khmeimim and the naval base at Tartous will extend Syrian air defence to a range of more than 400 kilometres. “Russia will jam satellite navigation, on-board radars and communication systems of combat aircraft, which attack targets in the Syrian territory, in the regions over the waters of the Mediterranean Sea bordering with Syria,” Shoigu added in the Monday morning declaration. He explained the Stavka’s rationale: “We are convinced that the implementation of these measures will cool hotheads and prevent ill-considered actions threatening our servicemen. 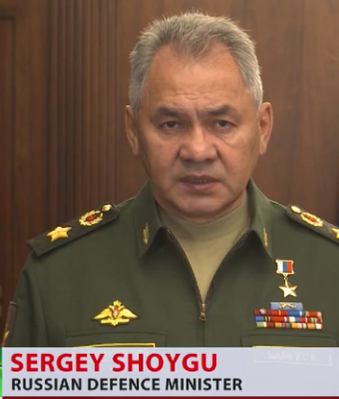 Otherwise we will have to respond in line with the current situation.” Shoigu’s references to “hotheads” and “ill-consiodered actions” were not only meant for foreign military, but also for those lobbying President Putin in favour of Israel, Turkey and the US. Dmitry Peskov, Kremlin spokesman and the principal lobbyist on Putin’s staff for Turkey, tried to dilute the meaning of the new measures. Left: Erdogan with Peskov and between them Foreign Minister Sergei Lavrov, at Antalya, November 2015. Right: Erdogan with Peskov, and on his right, Lavrov and Yury Ushakov, Ankara, April 2018. Within minutes, the Kremlin posted a record of a telephone conversation between Putin and Syrian President Bashar al-Assad. This was the first contact reported by the Kremlin with the Syrian president over the week since Putin had negotiated an agreement in Sochi with President Recep Tayyip Erdogan for Turkish occupation of Idlib governorate; the text of their pact was leaked by Turkish media. For details, read this. The Kremlin record of Assad’s call was marked 13:30. Five hours later at 18:15, the Kremlin reported a telephone-call between Putin and Israeli Prime Minister Benjamin Netanyahu. With the Israeli prime minister Putin ignored the Stavka’s detailed assessment of that morning, although Putin claimed elsewhere during the day that the briefing had been “fully coordinated with me”. 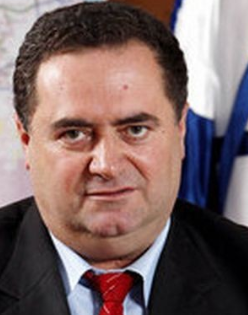 Major General Igor Konashenkov had accused the Israelis of spoofing Syrian air defences and creating an ambush for the Russian aircraft. For details of Konashenkov’s first briefing, read this and watch the presentation. Watch as it was broadcast on the Sunday evening national television news by Rossiya-24. 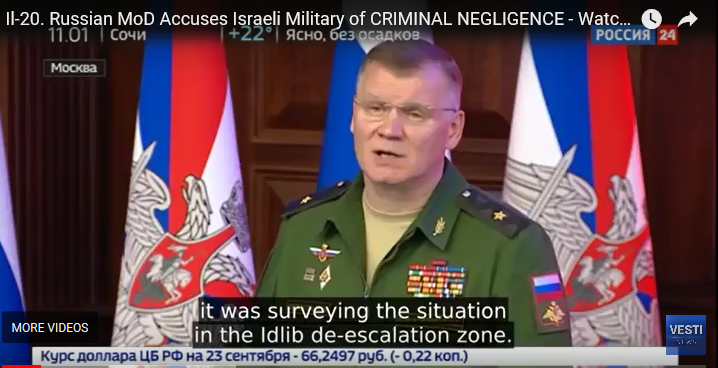 Konashenkov announced: “objective data says that the actions of Israeli pilots, which led to the death of 15 Russian military personnel, point to either lack of professionalism or criminal negligence. 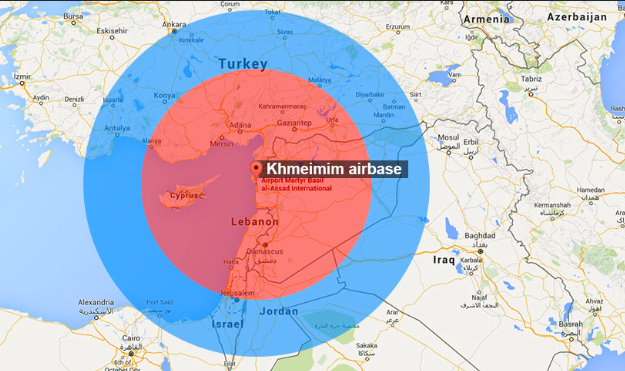 This is why we believe that the Russian Il-20 aircraft tragedy is solely the fault of the Israeli Air Force and those who made decisions concerning such actions.” Konashenkov also charged the Israeli military command with lying to the Russian operational command at Khmeimim in identifying in advance their target areas; lying about their manoeuvres around the Il-20 as it began its approach for landing at Khmeimim; lying about their attack aircraft positions off Latakia when the Il-20 was hit; and lying about the Israeli reponse after they had been notified the Russian aircraft was “in distress”. Konashenkov revealed that the captain of the Russian aircraft was in communication with ground control for four minutes after his plane was struck and before it crashed into the sea. Konashenkov also said the Israeli attackers remained over the crash scene for eleven minutes before they returned to their base. The day after the second briefing, yesterday morning, the Defence Minister announced the new Russian war policy in the Middle East. He was followed in the afternoon by a fresh briefing, the third by Konashenkov, with new radar tracking evidence showing exactly how the Israeli F-16 fighter-bombers had ambushed the Russian reconnaissance aircraft by drawing Syrian S-200 missile defences away from their initial lock on the Israeli targets. 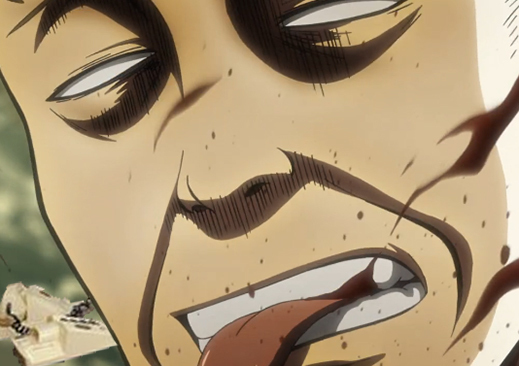 Source: https://www.youtube.com/ For partial English translation and text, read this.